Group Exhibition Of Paintings By Bangalore Artists is an event that took place between 05-May-2007 and 15-May-2007 in Hyderabad. The beauty of being an artist is the ability to execute the power of metaphor. Multiply that by 4, and there's all the reason to be at Shrishti this week. 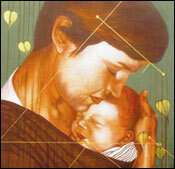 An exhibition of four popular artists from Bangalore is on at Shrishti Art Gallery on Road No. 15, Jubilee Hills, from 5th to 15th May. T M Azis, C F John, Murali Cheeroth and Vivek Vilasini are displaying 20 of their paintings at the gallery. Crowds are part of city life in our country. It's easy to get lost in the crowd and even feel lonely among the masses. Azis' works capture these countless faces in the background with a feeling of loneliness pervading through. T M Azis studied BFA from the College of Fine Arts in Trivandrum, and did his MFA from Jamia Milia Islamia, New Delhi. He had his solo shows at Fine Arts College Gallery in Trivandrum, the Alliance Francaise in Pondy, Chitra Kala Parishat, and thrice at Crimson Art Gallery in Bangalore. He's also been in various group shows at Bombay, Bangalore, Chennai, New Delhi, Kochi, New York, Dubai, Jakarta, London and Romania. Man invariably strives for balance in his life, relationships and nature. It is definitely an important part of life, and the endeavor is to constantly achieve balance. John makes an attempt to look at this balance, as, for him, it is negotiation and balance that humans make with gravity. His canvas tries to portray this negotiation and celebration - be it in the outstretched hands of the figures in the canvas, the gentle waves of the water, or the mother-child image. After his studies in philosophy, John opted for the age-old tradition of Gurukul, and had his initiation in art under Jyothi Sahi at Silvepura, Bangalore. He has also been a disciple of Anthony Devasy of Kalakendra Thrissur. Apart from gallery shows, John has also been working on site/theme specific art events using installations, dance and photography. He's exhibited his works at Alliance Francaise and Gallery Sumukha in Bangalore, Mainz and Saarbrucken in Germany, and Landscape Parables at Malabar House, Cochin. Man has been on the move since time immemorial, and migration is conditioned by various factors. It is an ongoing process. Murali tries to attract everyone's attention with an overpowering image of a boy playing with a toy bus. The boy is painted in the context of maps in the background, and in each image, the background location changes. But the exact geographical locale is not clear. Murali Cheeroth studied BFA and MFA at Kala Bhavan, Shantiniketan, and did a Diploma in Multi-media Computer Arts from CDA-C, Ahmedabad. He's exhibited his works at the Kashi Art Gallery Kochi (with Binoy Varghese & T M Azis), in a two-man show at Contemporary Art Gallery, Ahmedabad, and at the National Human Rights Conference at MRA Centre, Panchgani, in Maharashtra. Vivek Vilasini had trained as a Marine Radio Officer at the All-India Marine College, Kochi, in 1984 and later pursued B A in Political Science, at Kerala University. He studied sculptural practices from traditional craftsmen. His works were selected by M F Husain at Vadhera Art Gallery and Rabindra Bhavan. He was part of the Six Artists Group Show at the UAE Fine Arts Society Annual Exhibition at Sharjah Art Museum, at Contemporary Art Gallery, and at various other shows at Delhi, Dubai, Kochi, Bombay, London, Bangkok, New York, Rhode Island and Dublin. Vilasini is concerned by the slow disappearance of our indigenous languages in an increasingly global world. This is portrayed in works showing a world that is dotted with alphabets in Malayalam and Devanagiri, thereby pointing to a literary heritage which is fast diminishing. For further details about the exhibition, please contact the gallery at 2354-0023. Be the first to comment on Group Exhibition Of Paintings By Bangalore Artists! Just use the simple form below. fullhyd.com has 700,000+ monthly visits. Tell Hyderabad what you feel about Group Exhibition Of Paintings By Bangalore Artists!